Why do I ride: Is there a good reason not to? If so, I’ve yet to hear it. My biggest challenge so far: My mountain bike skills are mediocre, and I get nervous on fast, technical descents! 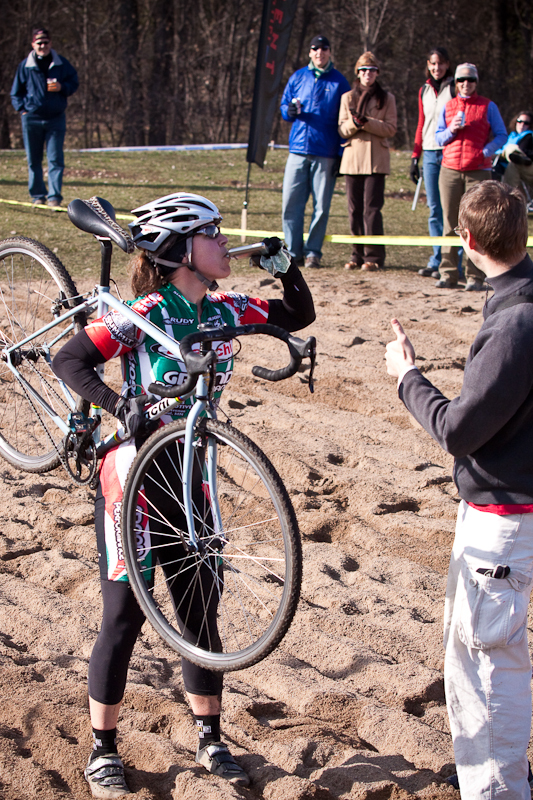 My future goal for cycling: Short term – work on those mountain bike skills so that I can be faster in cyclocross. Long term – keep riding! I remember reading a story about a young woman (80 years young) who rode 50 miles to go see her son and his family…. I wanna be like her! Best biking story: My favorite biking story is from this past spring. I taught my freshman seminar during the spring of 2009, and the last day of class was a bike scavenger hunt. We finished at Izzy’s, and while we were waiting in line, one of my students said to another – We really rode more than 13 miles today? I never thought I could do that! She was smiling and laughing and generally having a great time. The weather was sunny, windy, and chilly… and she loved it! What turns my crank about cycling: It’s the whole deal, and I hope I keep my crank turning for another 40 years or more!